PHAGWARA, August 19: Punjab Pradesh Congress Committee president Capt Amarinder Singh today asked the Chief Minister Parkash Singh Badal not to rest on self laurels over Punjab Governor being reappointed Chandigarh administrator and instead assert the state’s complete claim over Chandigarh, with the central government. Capt Amarinder also asked Delhi Chief Minister Arvind Kejriwal to explain the charges of his NGO ‘Parivartan’ having been funded by the Ford Foundation and the CIA. “The way Mr Badal is reacting over the central government’s decision to reverse the appointment of separate Administrator seems he has completely forgotten that Chandigarh actually and completely belongs to Punjab”, he told reporters during the sidelines of the ‘Halqe vich Captain’ programme here today. He said, there cannot be a better and more conducive situation for Mr Badal as there is an NDA government at the centre of which the Akalis are partners and a friendly BJP government in Haryana. “If he does not get it done now, it means he was never serious about Punjab’s claims over Chandigarh”, he remarked. Asked to comment on Mr Badal’s statement that 2017 election will be the fight between pro-and anti Punjab forces, the PCC president remarked, “there cannot be a greater enemy of Punjab than Mr Badal”. He said, the way Badals had looted and robbed the state for ten years qualifies them for the title of being the enemy number one of Punjab. Replying to a question on Kejriwal, Capt Amarinder referred to his association with the Ford Foundation and the allegation of his NGO being funded by the CIA. “Kejriwal was never serious about anything as when he was working in the central services he never attended his office and instead ran an NGO which was funded by the Ford Foundation and the CIA and when he became CM of Delhi, he never got serious about it either and instead started straying and loitering around other states like Punjab and Goa”, he said, while questioning Kejriwal’s credentials to be the Chief Minister of Punjab. The PCC president said, the AAP’s graph had already gone down with senior leaders revealing as how they were asked to pay Rs 50 lakhs for the party tickets. He asked as why the AAP did not trust Punjab leaders including its state convener Sucha Singh Chhotepur who was being ignored and sidelined during the ticket distribution process. About estranged BJP leader Navjot Singh Sidhu’s possibility of joining the Congress, Capt Amarinder said, he was always welcome. “Sidhu has Congress DNA in him and he will always be better off in the Congress than any other party”, he said, while accusing the AAP and its leaders of ditching and cheating him. Earlier during interaction with the party workers of the Phagwara assembly constituency, Capt Amarinder announced that the Congress government will provide 5 marlas of land and money for constructing houses to all those who do not have own houses. The PCC president reiterated his commitment to eradicate the scourge of drugs within four weeks after forming the government. Replying to a question by a lady who asked what he will do against those responsible for spreading the scourge of drugs in Punjab, he said, they will all be put behind the bars. He said, he was committed under oath to take action against all those and he knew how to do it. 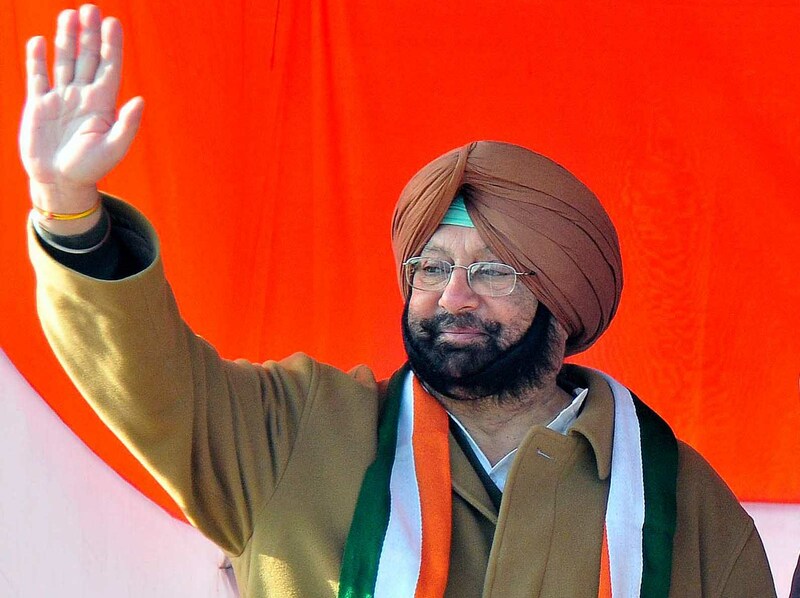 Condemning Sukhbir Badal’s dismissive and scornful reaction to his bus killing father-son duo in an accident in Ludhiana on Thursday, Capt Amarinder said, this was extreme arrogance which will soon come to an end. He also announced that he will put an end to the “transport terrorism” of the Badals. He reiterated that all the extra route permits will be distributed among the deserving unemployed youth who will also be provided financial help to buy buses. He said, he will finish the Badals’ monopoly on all the businesses whether transport, cable, sand mining and liquor trade. Among those present on the occasion included Joginder Singh Mann, Balbir Raja Sodhi, Harjit Singh Parmar, Harjinder Thekedar, Jarnail Singh Nangal and others. Capt Amarinder later went to see Gurbans Singh Walia, Leader of Opposition in Municipal Committee, Phagwara, who lost both his eyes due to the water canon during protest against land acquisition in Chandigarh.